The following is my rather unscientific description of the honeybee life cycle. If you would like further reading, stroll on over here, or, for a nifty pictorial step-by-step version, click here. In a well functioning hive, the queen bee is the only honey bee capable of reproducing and sustaining the colony. When the queen hatches, she is called a virgin queen. She leaves the hive and does a mating flight, where copulation with male honey bees, called drones, occurs. She is now a mated queen. Upon her return to the hive, she begins her queenly duties: laying eggs. The queen lays a tiny white egg into an empty cell that has been specially prepared and cleaned by worker bees. (See illustration, above). A good queen will lay thousands of eggs per day. After three days, the egg hatches and a small larva emerges (part two of the illustration). The larva goes through five stages (or stars). The larva is referred to as "the brood" and is fed and cared for by worker bees. In the last stage (on the 9th day of the larva's existence), the a cap is placed upon the cell by nurse bees and the larva pupates. Up to a week later, the brand new honey bee emerges from her cell and begins life in the colony. The length of time for the above-described process varies, depending on the type of bee. For example, a queen emerges from her cell in 16 days, a worker in 21 days and a drone (male) in 24 days. The life of a an adult worker bee is hard; she may only live up to three or four weeks before dying. 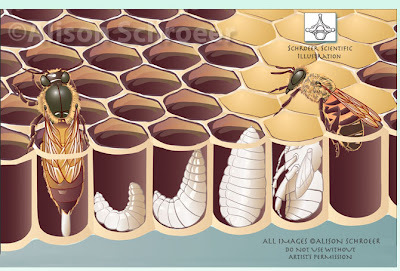 Scientific artist Alison Schroeer kindly granted me permission to use her lovely bee life cycle illustration. I looked through hundred of life cycle depictions on the web and this one was the best. Thank you, Alison! You can find her more work on her website, Schroeer Scientific Illustration.